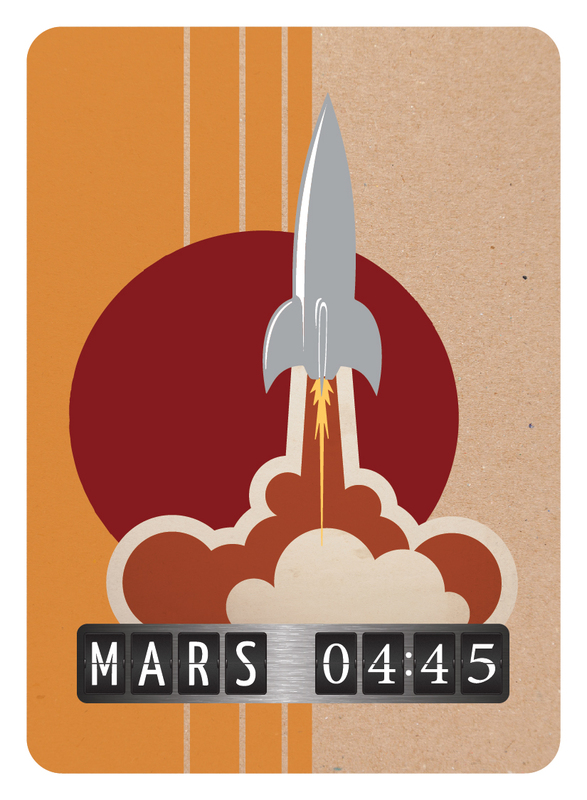 In Mars 4:45 each player is a Mission Director, racing to establish the first colony on the Red Planet. Mission Directors compete to construct all the modules necessary to start a Mars settlement, sourcing as many parts internally as possible to maximize profitability. Mission Directors will need to build Power Modules, Science Modules, Resource Modules and Exploration Modules. If you are a fan of Dutch Blitz, Nertz or Pounce; you will pick this game up very quickly. We need your help! This will be our first game going to Kickstarter and we need to spread the word. We are looking at a Sept 1st to launch so over the next two months I hope you get to know the theme, art and mechanics of the game. Please give the rules a read and watch our upcoming tutorial videos. If you have any questions please don’t hesitate to ask. We want this game to succeed and we want you to get to know and enjoy this game as much as we do. When we started on this design journey, the first game we really developed for a Kickstarter campaign was Charge! and army building card game. 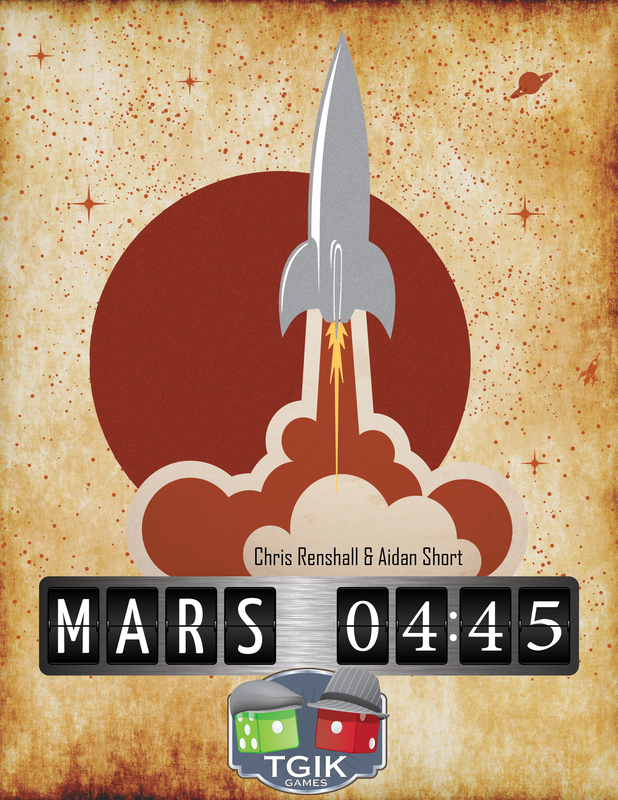 That game has been re-themed into Mars 4:45 a Colony building card game. I will write a proper introduction to the game when we are closer to the KS campaign that will include art and diagrams and maybe even some videos of game play. What we have for you today are the rules we finished writing last weekend. I invite you to take a look at the rules and give us your feedback. Give yourself a flavor of what to expect. There are pictures and diagrams that need to be added but the entire text of the rule book is there. If you like reading rules or you would like to know more about our first project coming to KS, please take a look and tell us what you think. I don’t want to show off the fronts of our cards yet, I have some special plans for that art. What I will show you are a couple of the card backs to give you a feel for where the art is going. As a designer, one of my mantras is, Analysis Paralysis (AP) must be defeated. Again, I think there are players and places where AP is ok, but I am not that player and the games I make are not the right places. The core of what causes AP is the process of a player making a choice. What are the variables a player needs to look at? What are the risks and rewards attached to the pending decision? If the goal of the game is to gain the most money and every action a player take gives them some about of money or allows that to set up for more money later on, the game becomes a constant calculation. Calculation, while fun for some, is a dangerous neighborhood for games to live in. Calculation allows for AP, which takes the focus off the game board and onto the player who needs to run every permutation. Calculation isn’t fun. Sure there are numberphiles out there that will love a mathy game, but math isn’t choice. Why do Star Wars fans hate midi-clorians so much? They take the mystical force and turns into in to a calculation, a blood test. What makes the resistant hero so interesting? They have to struggle with the choice of the hero’s path and life they don’t want to leave behind. The same principle holds here. Calculation is stale bread. So how do we fix this? More variables…..I kid you not. Going back to the game with the goal of gaining the most gold. What if the goal was to gain the most gold, have the leave corruption, explore the most territory and have the healthiest citizens. What if those goals had little to do with each other or in a more general sense, there was not easy way to compare the value of one reward to another. Lets call this an exchange rate. If there is no exchange rate in the game, the calculation players need to make is much smaller. Rather than factoring in all the details of the entire game, the decisions become more general. Example: This turn I need to gain a worker. Of the four goals of the game, three of them have no bearing on my current need to gain a worker. I can no focus on the factors in the game that allow me to gain a worker. We’ve been working on a game with a working title of Soul Hunters and we have run into an interesting problem. Calling for the villagers is too easy. The game has been tested two times and in both occasions it felt like the villagers were an easy way to bail our characters out of trouble. The villagers game function is pretty simple, to draw attention away from the heros inside the mansion. What I like about using villagers in this manner is the thematic connection to the town below that is referenced in the story of the game. What I don’t like is each player’s ability to call on them knowing the moment they are in trouble, they will be covered. So the idea of the villagers gets to stay, their mechanics need to change. The other question I had for myself was, would a playtester even catch this issue? Is it an issue for players or is it an issue just for me? This line of questioning gets me to the more general question, are there types of issues that only I would notice, because the player experience isn’t what I want it to be? That is a bigger topic for a different post. The question before us is, how do we fix something that is, in our designer view, “too easy”. I think the best way to fix this, is to incrementally boost the difficulty of calling the villagers. I like this method more than making a big change because I like the idea of calling the villagers and in game play, they perform their task very well and it fits the theme very well. Outside of the game they add to the theme. Lets say the way players call for the villagers is to discard two movement cards in order to ring a bell in the spire. If we make a change to discard 4 cards and you must be in a specific room, how do we know what the balance point is between two cards and 4 cards plus being in a location? It is possible the 4 cards and the location requirment will work, but what if discard 3 cards works better. What if you make more than one chance in the game and 4 cards plus a location works well with a change you made to a player ability but had you not made that player ability change the 4 cards and location would not work. More simply put, making a big change over here can alter too many variables for you to know exactly what is working and not working with your game. There are times when a big change is good. When you are early in the process and everything about the game can still change, making drastic changes can work. But in this case, I need a specific mechanic to stay in the game. I need to make changes to the mechanic and I can’t ruin the game while I am at it. If the lack of update regarding this series didn’t give it away (or the title of this post for that matter) Who Are You Working For is Dead. And I want to talk about why and what I learned from it. When we finished the first playtest of this game, the flaws were many and obvious. Part of the problem was the amount of time between me wrapping up the prototype build and the first multi player test of the game. I fumbled my way through the explanation of the game and even as I was explaining how the game worked, I could see the weak points. Honestly, it was not a fair playtest to judge the merits of the game. What I saw right away were the mechanical weak points; I did not see the weak points of player motivation and the way savy players can exploit the bidding system. When we started to play the game, the board felt “samey” and trying to figure out what rewards were worth the effort to pursue was difficult. There was too much information for players to consume and that prevented players from getting into the game. The game was a block to itself. When we starting to bid on contracts, players had enough options to allow for everyone to take their own path, simply put, there were not enough interaction points. I think the theory of the game is sound, but I don’t think the “real life gaming motivations” of the players works with the theory of the game. A theory that sounds like a lot of fun in my head doesn’t mean it will translate into a lot of fun when it is on the table. The feedback provided was warranted and all over the place. Now, if this blog and the podcast are any indication, giving up on a design is not my style. I think a design can be worked, fixed, replayed and made into a great game. So why is this game dead? It is a matter of logistics, focus and what this game will look like if it is ever completed. We have a long list of ideas that range from game ideas to websites and apps. When I started this design project, my plate was smaller and easier to manage. Now, we have a new game we are focused on, I have other projects going during the week and the attention this game requires right now does not fit into the weekly to-do list. I also think this game needs a complete overhaul of what it looks like and how it performs. As previously stated, the theory is good (IMHO) and I want to make it work. The mechanics of the theory need to be streamlined. In reality, this game is not dead, it has been reprioritized in the stack of ideas waiting to be worked on. It might be years until this game makes it to the top of the stack, but it is there waiting to be worked on. That gives me great comfort that the projects we have to “abandon” will have their chance and allows me to move on to the next project. I want continue the Let’s Design series, but I will pick a smaller game to design. I also want to add an audio element to it. I may even adda video element to it but I have some figuring out to do for that part. The google doc will stay alive, waiting for an update.